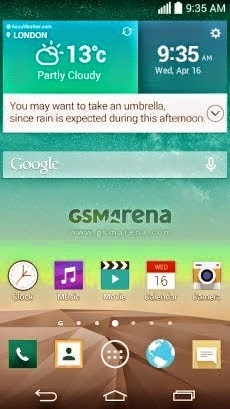 We all are waiting for the LG G3 and we have already seen many leaks and rumors about the LG G3 and the G2 successor is expected to unveil in May, which is not too far. 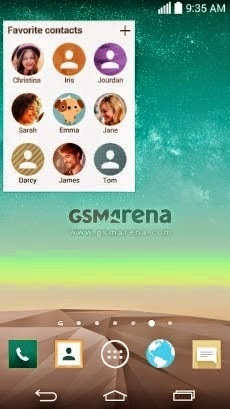 This time, the GsmArena have got the screenshots taken directly from the LG G3 and these screenshots confirms that the device will feature a QHD screen (2560x1440 pixels) and we have already confirmed this few days back that the QHD display is going to power up the LG G3 and redesigned flat Optimus UI. 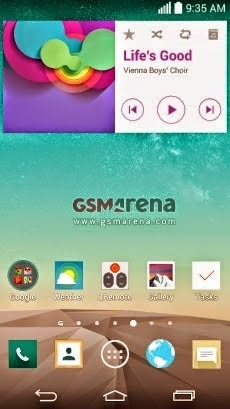 The screenshots of the LG G3 was provided to the GsmArean by a credible industry source and the screenshots looks very nice, specially the new user interface. Many new looks and feels are included in this new flat UI and some new features are also bundled with this new user interface. For a reminder, the LG G3 is said to feature a Qualcomm Snapdragon 801 SoC, clocked at 2.5GHz, 5.5 inch QHD display, 2GB of RAM, 32GB of an internal memory and you will also have an ability to expand the storage via an external SD card slot, 3000mAH battery and IPX7 rating, which means that the LG G3 will be water resistant. 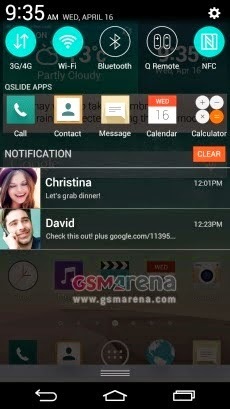 So, tell us that do you like this new UI, or are you still happy with the current Optimus UI?